Are solitary, nocturnal birds of prey, feeding on small mammals, birds and insects. Whilst owls are not taxonomically classed with the diurnal* raptors, or birds of prey, they share many of the physiological characteristics, requirements and traits of diurnal raptors. They have hooked bills, are carnivorous and, most significantly, use their powerful feet to catch and kill their prey. They fill an equivalent niche in the environment, and for all practical intents and purposes may be considered "raptorial" by nature. There are ten owl species native to Australia. NOTE: The Tawny Frogmouth is frequently mistaken for an owl. It is not an owl, but a member of the nightjar family. Much of the NSW South Coast is still heavily forested and hosts several owl species. 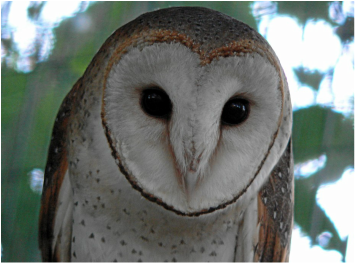 There are three species of Tytonidae: Masked, Sooty and Barn, the first two are forest owls, the latter is more at home in open land and around farmsteads. Of the hawk owls, the Powerful is found mostly in forested land, the Barking on woodland edges and around wetlands and the Southern Boobook in towns and open farmlands. The large forest owls - the Powerful Owl, Masked Owl and Sooty Owl - are each listed as Vulnerable under Schedule 2 of the NSW Threatened Species Conservation Act 1995. They are unique to the Australasian region and represent ancient elements of our fauna. The owls are of great scientific and community interest as flagship species for the conservation and management of mature forest ecosystems. As top order carnivores, they may also play an important role in the functioning of forest ecosystems and may act as indicators for other hollow-dependent and specialised species. The Powerful Owl is a very large (50-60 cm in length) brown hawk-like owl, with (for an owl) a rather small head and a long tail. It is brown dorsally, with narrow white barring, and white ventrally, with coarse V-shaped bars (chevrons). It has prominent yellow-orange eyes in a flat face and fully feathered legs with large yellow feet. Males are larger than females. Juveniles are initially much whiter and downier on the head and underparts. The Powerful Owl inhabits eucalypt forests and woodlands, gallery rainforest and inland riverine woodland. It often roosts and nests in dense gully eucalypt forest. Common roost sites are sheltered groves of mid-storey trees, e.g. sheoaks, turpentine, acacias, paperbarks, and rainforest trees. The Powerful Owl requires hollows for nesting, and many of its prey species are also hollow-dependent. The Powerful Owl feeds mostly on arboreal mammals, especially possums and gliders, some flying-foxes, birds and large insects. The main threats to the Powerful Owl as well as for the Sooty and Masked Owls are inferred to be clearing of habitat, including loss of hollow-bearing trees. Over 50% of forest and woodland in NSW has been cleared and the process is continuing. Moreover, prime habitat for the Powerful Owl; on richer soils and gentle terrain; has been targeted for agricultural clearing, logging, conversion to pine plantations, firewood harvesting, and urbanisation. Loss of old-growth elements is inferred to affect the native prey of the Powerful Owl; some of which require tree-hollows. Sourced: NSW Scientific Committee (2008) Powerful Owl Ninox strenua. *Animals with the opposite schedule are said to be nocturnal, which means they're active at night and sleep in the daytime. Diurnal can also be used to describe something that has a daily cycle, such as a diurnal tide that occurs once each day.